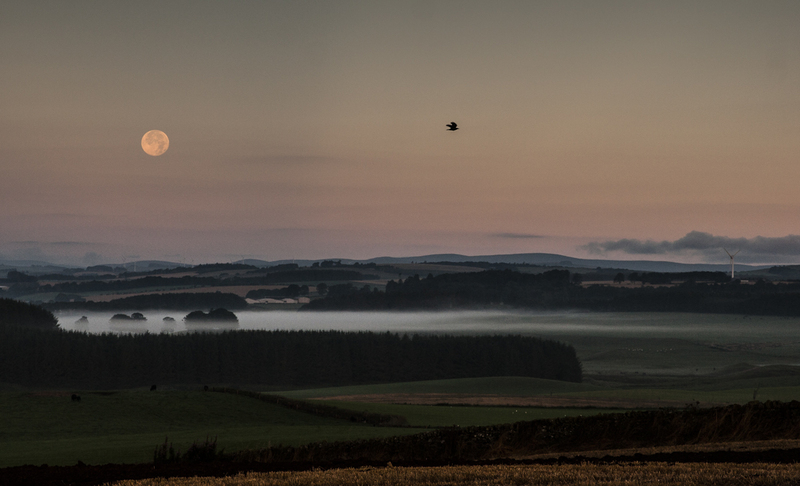 Up at five to drive to Glenshee. That's some dedication, although this journey would bring up my 50th Munro at last. There's a sense of order to the way I've approached these hills. 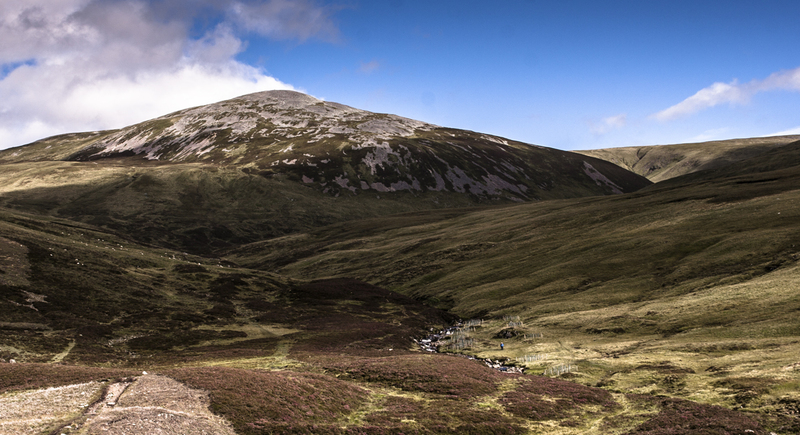 My first trip bagged two - Glas Maol and Creag Leacach. 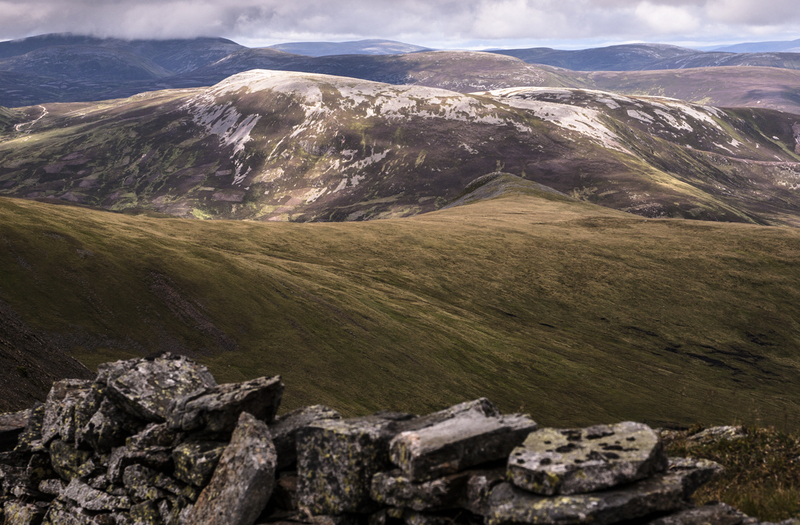 My second took in three more - Carn Aosda, Carn a' Gheodaidh (sp?) and The Cairnwell. All being well, this one would take in four and would leave the five around Loch Muick for my next trip. Dreish and Mayar will spoil things a bit, alas. 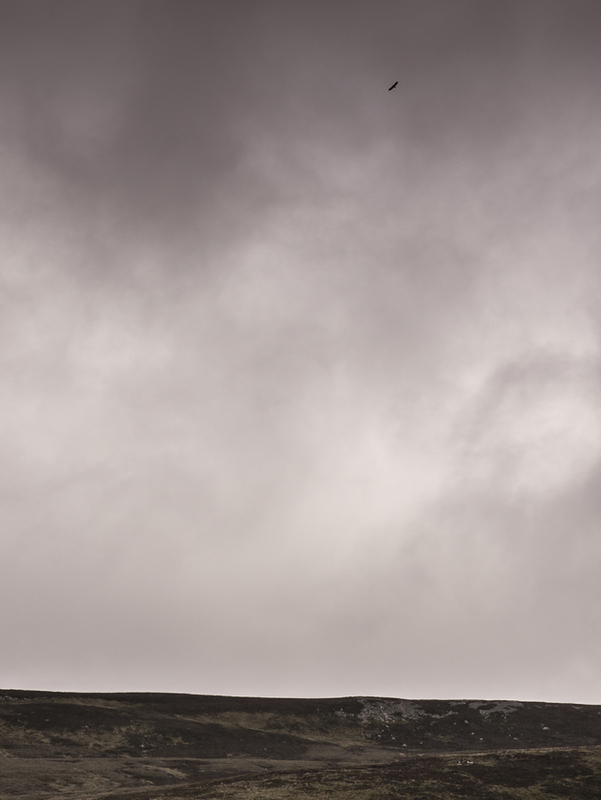 The hills had been clear as I approached but I was acutely aware that the Munros in Glenshee appear suddenly so I wasn't taking anything for granted with slate-grey rainclouds all around. 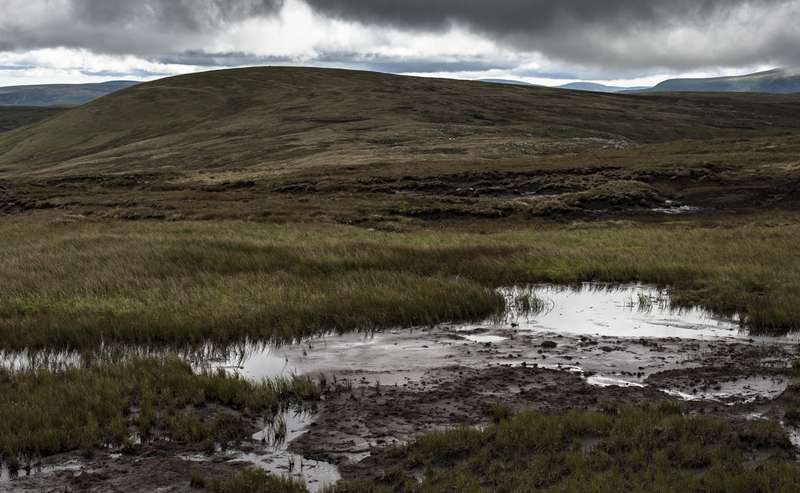 Sure enough, as I turned the corner toward The Cairnwell and Glas Maol, both of them were cut off at around 700m so I feared the worst. Happily, by the time I got parked, the day's first objective (Carn an Tuirc) was clear, although not what you'd call sun-dappled. As I wandered up the burn on approach, I remembered the guidance in Ralph Storer's book that said an old route to the left to climb by the North 'ridge' was gentler, and since I was in no hurry, that's the route I took. Everybody else on the mountain was dashing straight up the West face. As I left the path and looked for the other one, a Golden Eagle soared lazily over, and seemed almost to be posing for me just above the path (I only had a 17-70 lens so couldn't do it justice, alas). 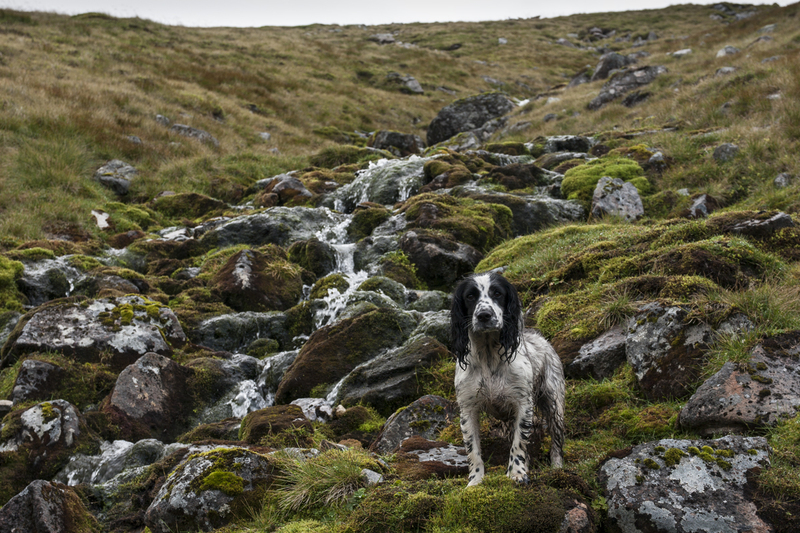 I concluded that the only reason it could be hanging about was that it was hungry and eyeing up my dog, so I kept her close by as I carried on around to the ruined hut (it took me ages to find the right path; much splashing through bog, although it was to be a feature of the day). 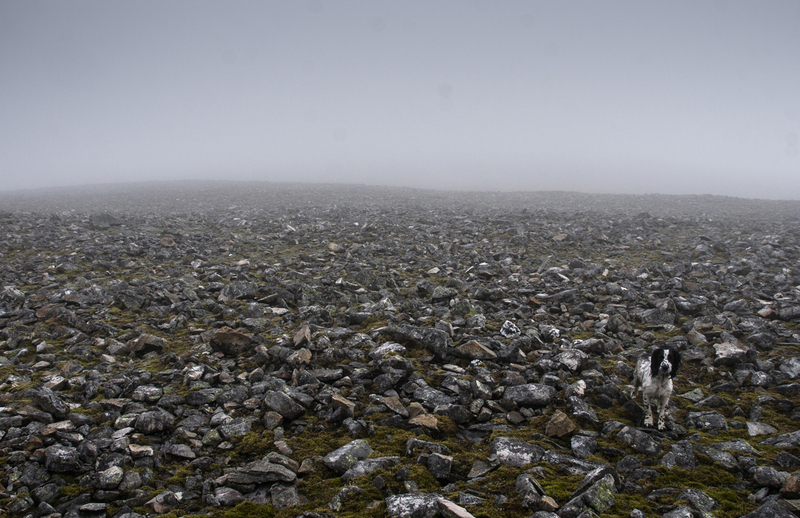 As I got to the stony top dome of Carn an Tuirc, the rain came on and the cloud came down and I had some misgivings about a journey across the plateau to Tolmount and Tom Buidhe; occasional gaps in the cloud revealed a topography much more complicated than I was expecting from looking at the map. 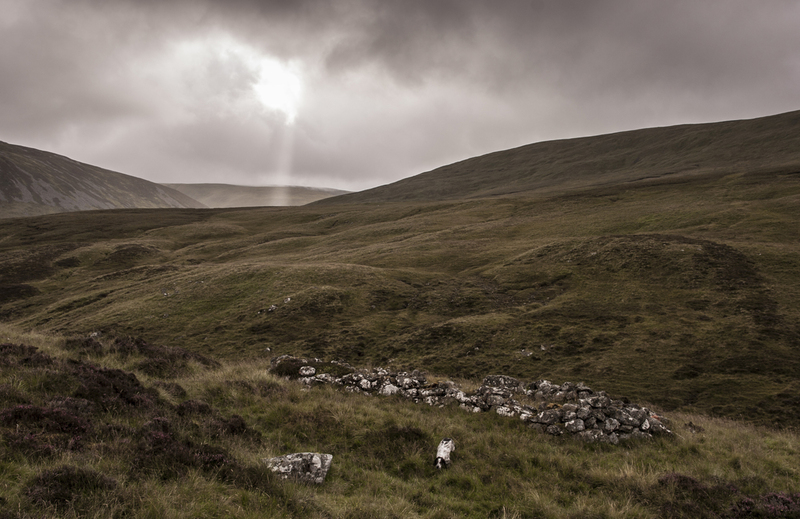 The cloud soon lifted, though, and the stones gave way to grass and path, and I could see Tolmount across the plateau, considerably lower than I was, with no obvious reascent required, and almost within touching distance. "This", I thought, "is ridiculous. There's no way that can be considered a separate munro". I hadn't done a lot of research for this part of the walk, and a ruined wall looked a good pointer, so I set off on a beeline that I regretted soon after I arrived in the dismal bog that the wall leads to. I still wasn't in a hurry, so headed up to the path between Tom Buidhe and Cairn of Claise and climbed both of the Westerly Munros from that, straight up and down both and back to the same spot. I did this in rain and cloud and I can't pretend that I enjoyed them much (although the views over toward Lochnagar were lovely), and cursed Sir Hugh, convinced he'd only included them because they were close to home for him. Cairn of Claise is a bit more interesting; unexpectedly rocky and a nice route down around by Sron na Gaoithe. I lost the path completely at the top of Sron na Gaoithe (is there one? I guess there must be, somewhere) so finished the day on my least favourite descent terrain - tough, wet, steep grass. This led to further bogs and by the time I got back to the car, six hour plus after setting off, I was pleased to be finished with them and melodramatically vowed never to return. As usual, the drive back put things in perspective. 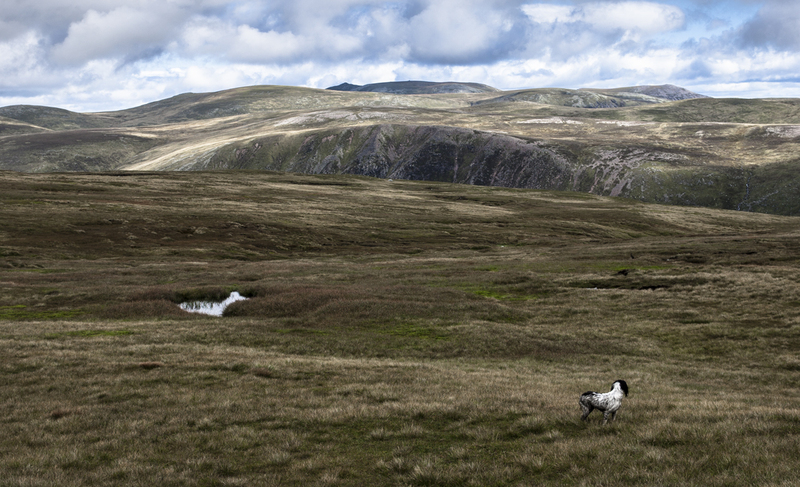 The ascent of Carn an Tuirc is pleasant enough, and the views into Glen Callater and toward Lochnagar as you approach Tolmount are lovely. All things considered, I did actually enjoy the walk although it was much more testing than I expected it to be. Even so, Tolmount and Tom Buidhe in the tables? I'm pleased I'm not responsible for deciding what is and what isn't, but approaching them in this direction they don't seem to deserve it - and even Carn an Tuirc seems a little bit spurious when you consider the small reascent required from Cairn of Claise. Of course, if it wasn't a Munro, how many would bother with the lovely looking walk down Glen Callater to approach Tolmount as it's meant to be approached? 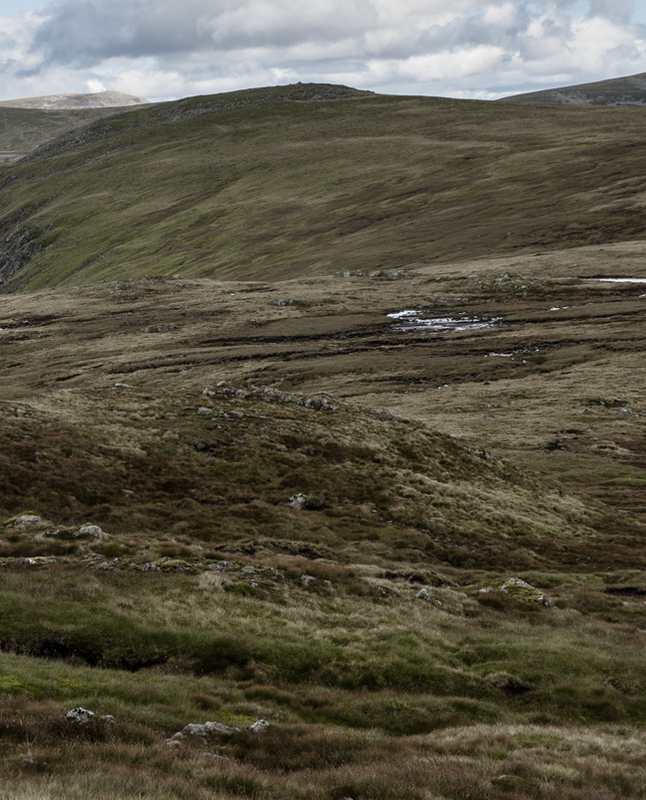 All of us who've been at this a while will have had misgivings about climbing hills solely because they appear in the tables, and there are a few areas of Scotland where it's more obvious than others. In the far North, it's the hills you miss out which make you think that ticking lists is not the best way to see this country. 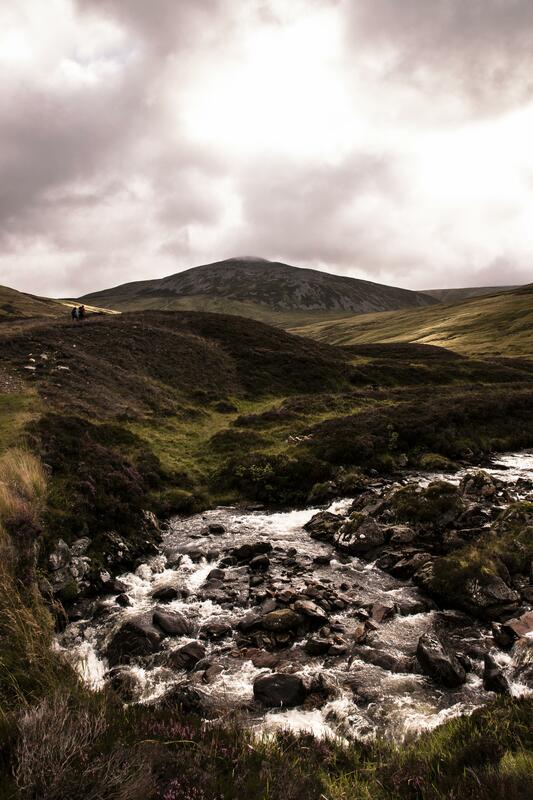 Around Glenshee and the Mounth, it's the ones you have to splash your way up to which have you wondering who put this in there? 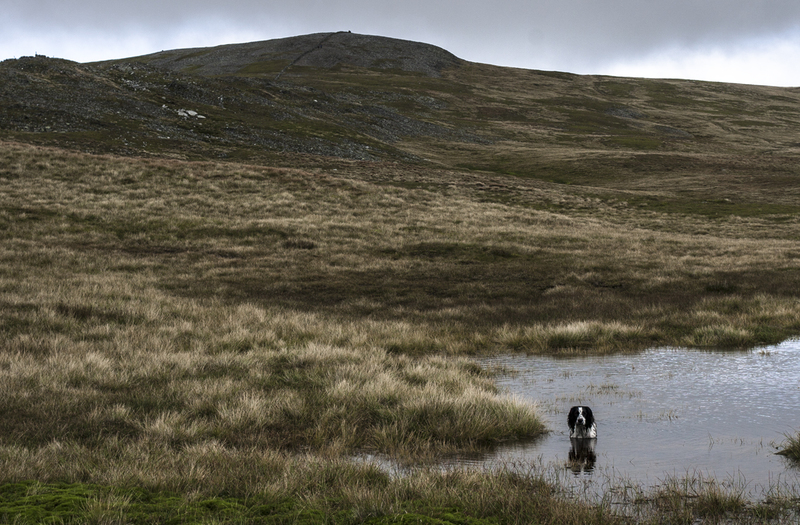 It wasn't a day for photographing the route as I usually do; frequent cloud covering the tops and light rain were a feature for the whole time, so here are some selected views (mostly featuring my intrepid, and fitter than me, Spaniel) from when the rain abated. 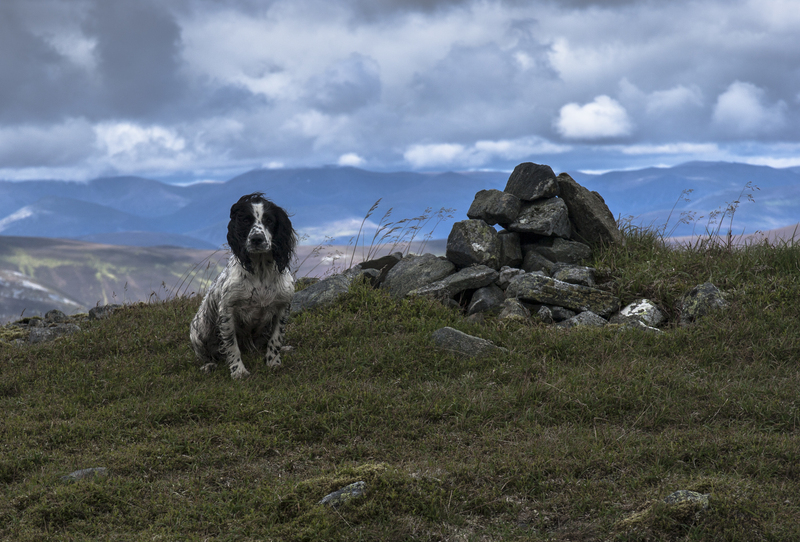 Carn an Tuirc summit. Navigational misgivings. 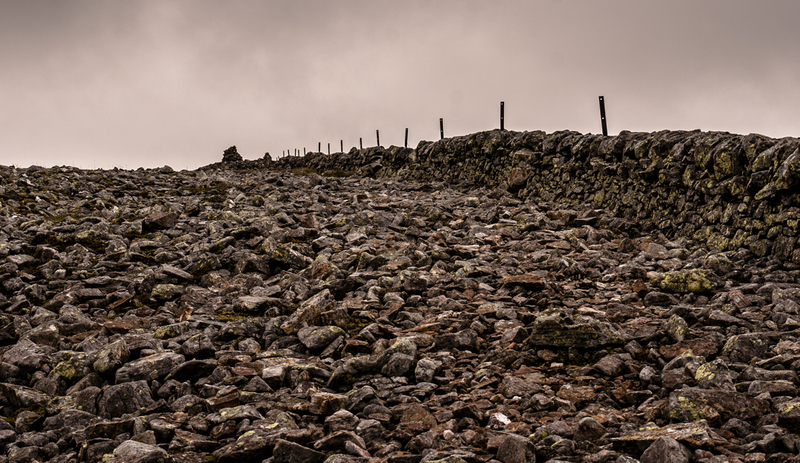 There's lots of good walks in that area, but they just aren't the most efficient from a Munro bagging point of view, and so aren't in many guidebooks! 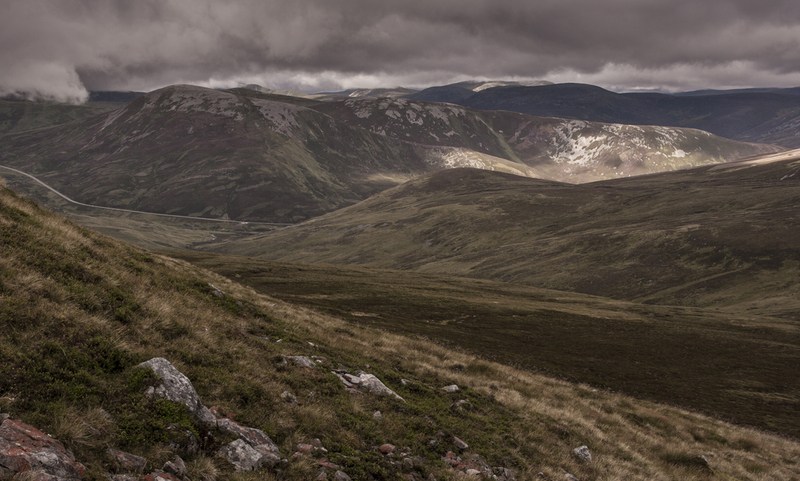 Tom Buidhe and Tolmount are more rewarding if approached from Glen Clova: for example, including them in a round with Cairn Bannoch and Broad Cairn is a good day out. Aye, I was discussing routes on another forum with Guinnessman and it seems fairly clear that the hills around here can be linked however you fancy, really. I wasn't particularly looking forward to the two lower Munros here so just decided to tack them onto the other two in the interests of getting them out of the way (terrible attitude, I know) which will leave Dreish and Mayar approachable from the South and Coire Fee, and then the five around Loch Muick to be done in whichever way seems appropriate (looks like climbing Lochnagar first then basically coming down off it in an anticlockwise spiral round Loch Muick won't make an awful lot of extra ascent than just Lochnagar on its own).